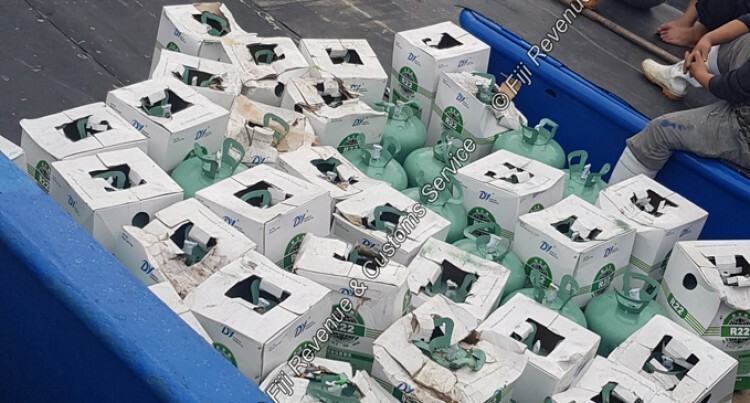 The Fiji Revenue and Customs Service (FRCS) Customs Border Maritime Compli­ance Team intercepted 50 R22 gas cylinders, which is an Ozone de­pleting substance, from a fishing vessel at the Suva Wharf on Friday. After receiving advance notifica­tion, FRCS’ compliance team noted the vessel was in the Australian Ex­clusive Economic Zone (EEZ) but avoided Australian border officials and entered Fiji waters. “This was suspicious and thus the vessel was flagged by our Customs Border Maritime Compliance Team comprising of Customs Officials searched the vessel and was suc­cessful in detaining Ozone deplet­ing gas cylinders,” FRCS chief ex­ecutive officer Visvanath Das said. “The vessel falsely declared the amount of R22 Gas Cylinders on board and it was concealed in a manner with a clear intention of smuggling the cylinders. Mr Das assured FRCS was com­mitted in supporting the well-being of the environment and work­ing in partnership with relevant stakeholders in combating illegal imports of ozone depleting sub­stances. The cylinders have been handed over to the Department of Environ­ment.